The patron saint of St. Charles Church is St. Charles Borromeo (1538-84). He was ordained a priest in 1563 and was consecrated bishop of Milan the same year. He died at Milan on the night of November 3-4, 1584 (at the age of 46), and was canonized in 1610. He was one of the towering figures of the Catholic Reformation, patron of learning and the arts, and though he achieved a position of great power, he used it with humility, personal sanctity, and unselfishness to reform the Church of evils and abuses so prevalent among the clergy and nobles of the times. His feast is celebrated on November 4. St. Charles Catholic Church was established in 1886 and belonged to the Diocese of Wilmington until it became part of the Diocese of Richmond in 1974. 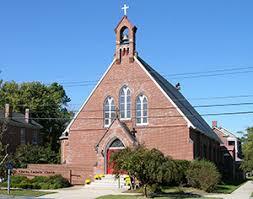 It was the first and for sixty years the only Catholic church on the Eastern Shore of Virginia. The church was built in 1889 by its founder and first pastor, Father Edward Mickle. He remained pastor of St. Charles for forty years. In 1927 he was elevated to Monsignor for his years of labor on the overwhelmingly Protestant Shore. Upon his death on August 16, 1930, Monsignor Mickle, “The Apostle of the Eastern Shore,” was buried at a spot between the church and the rectory. This was a place where he used to sit in late afternoon reading his breviary or chatting to people coming home from work. The original building expense of the church was met by a gift from the Abell’s of Baltimore, owners and publisher of The Baltimore Sun, and friends of Father Mickle. Later were included the rectory in 1893-1894, the convent and school in 1898. the school, which specialized in music and elementary education, was opened with four Catholic pupils and four teachers – Sisters of Francis. The Sisters were a very important part of the church and had many duties beside teaching. When on one Sunday of every month the pastor would be out on one of his missions, the sisters would ring the bell and read the Ordinary of the Mass and Gospel. The school closed in 1935 and was later used as a public school. When Father Mickle came to Cape Charles in 1889 there was scarcely a handful of Catholics in a territory that included Accomack and Northampton counties and a few Eastern Shore Counties of Maryland. Today the parish of St. Charles (covering all of Northampton County) is growing with a scattered congregation numbering approximately 150 families.